In his first ever Schools International, Morpeth Harrier’s and Northumberland’s Andrew Knight again performed well to finish an excellent second in the shot putt. At the event, which was held in Grangemouth on Saturday, Knight finished behind winner Lewis Byng of Rugby & Northampton in the U17 Men’s 5k shot putt competition. Whilst English Schools Champion Byng, putted a lifetime best of 19.40m, which lifted him to fourth overall in the UK all time U17 lists, Knight’s 16.71m put him well clear of third placed athlete Gergely Pap of Ireland. Considering Knight could barely putt 8m when he first linked up with his Morpeth coach Paul Reed as a mere 14-year-old, and has now achieved a lifetime best of 16.96m, which firmly places him as No 2 to Byng in the UK U17 Men’s rankings, speaks immense volumes of the quality of work that he has put in with Morpeth’s former International senior thrower, something which Reed himself is immensely proud of. Unfortunately, because of a family move South, he will soon be parting ways with Reed, and will be competing for Southampton and Hampshire next year. However, before leaving, Knight still has two or three more competitions as a Morpeth athlete, including the most important English Championships next month. Knight takes with him a great deal of thanks and admiration from his club, who will very sadly miss having him around. * Morpeth Harrier Laura Weightman firmly signed off her preparations for next month’s European Championships in Berlin, by producing a lifetime best performance in Sunday’s Women’s Mile event at the Anniversary Games, held in London’s Olympic Park. Weightman finished an excellent sixth in a talent filled four lap event, posting a time of 4m20.49s, one place, and just over a second adrift of her UK rival Laura Muir of Dundee, who will join her in Berlin. The race was won by the Netherlands Sifan Hassan in 4m14.71s, who in the end enjoyed a runaway victory from Ethiopia’s Gudaf Tsegay, with pre-race favourite Helen Obiri of Kenya finishing third. 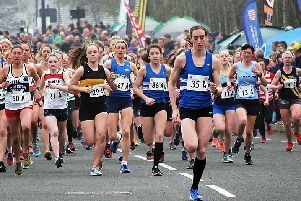 * Morpeth Harriers team of young Male and Female athletes, finished in an accomplished second place in their final NEYDL Division 1 fixture, held at Hexham’s Wentworth Stadium on Sunday. That excellent second place, albeit by a nine-point margin over third placed Blaydon Harriers, meant that the club also finished second cumulatively for the 2018 season. At the end of affairs, Harrogate emerged as winners on the day, firmly cementing their Championship status, and it was lowly Chester Le Street, and former champions Blaydon Harriers, who faced the drop into the second tier for next season, after finishing fifth and sixth cumulatively. On the day, Morpeth managed a total of 33 event wins, 20 of them being A String, with 13 being shared by B String performances. It was U17 Andrew Knight who deserves commendation for one of the performances of the day, by putting an excellent 16.45m in the shot, winning by over two metres from North Shields Poly’s James Wordsworth. Other good performers in the U17 Men’s events were Tom Balsdon and Andrew Hudspith, who produced a double victory for the club in the 1500m, Tom taking the A race in 4m22.86s, with Andrew winning the B race in 4m48.94s. Ben Waterfield was certainly a star in the U15 Boys events, winning the A races of the 300m and 800m events, posting times of 41.4s, and 2m13.32s. Another A String track winner was Euan Duffin, who won the 1500m in 4m28.62s, which also saw an excellent Morpeth double victory, courtesy of Dylan Gooding taking the B race in 4m47.36s. Morpeth also had great service from their U15 Boy Field eventers, who pulled off at least four double victory successes. Koffi Avornyo cleared 1.50m to win the A String high jump, and Thomas Damaher cleared 1.45m to claim victory in the B String competition. Theo Brown and Nat Arkle certainly proved to be a most formidable partnership for Morpeth. Brown won the A String Discus, producing a best throw of 30.04m, and Arkle took the B String with 23.11m. The pair swapped roles in the Hammer competition, with Arkle winning the A String with a best throw of 25.81m, and Brown took the B String with 21.74m. Arkle had his second A String victory in the shot, producing a best of 9.44m, and Brown won the B String with 8.08m. Daniel Dowd provided Morpeth with another A String victory, when throwing a best of 40.52m in the javelin. Morpeth’s other winner in the Under 15 Boys events was Max Marr, who won the 200m B String in 26.8s, supporting Josh Adams’s third in the A String in 26.2s. Morpeth U15 Boys certainly backed themselves up well in the 4 x 100m Relay, finishing second in 52.6s. The clubs U 15 Girls performed well by producing four A String wins, along with two B string victories. Two of those A Strings belonged to Jessica Gardiner, who had competed at the English Schools competition on the previous day. Gardiner won both the A string Discus and Hammer, with respective throws of 23.36m, and 33.54m. She also finished second in the javelin with 22.16m. Other A String wins came in the 300m, courtesy of Mia Belton (43.5s) and 75m Hurdles courtesy of Amy Lott (11.7s), who had also competed at the English Schools Championships. Morpeth’s two B String victories in the U15 Girls, came courtesy of Ellie Longstaff in the 100m (13.5s), and 200m (28.6s). It was good to see Morpeth’s U13 Boys making a valuable contribution to the days successes by producing two A String wins along with three B String victories. The A String wins came from Bertie Marr and Harry Brown. Marr won the 1500m in 4m59.88s and was well backed up by Ryan Davies in the B String, who won in 5m00.37s. Brown won the A String Javelin with 26.68m, and Edward Gardiner won the B String with a best of 25.18m. Gardiner also finished a good second in the shot, missing out by a mere 71cm. The other B String winner in the Under 13 Boys was Oliver Omoigue (14.4s), backing up Harry Brown’s second in the 100m A String (14.2s). Morpeth’s four U17 Women certainly did their best to achieve some respectable results for the club. Charlotte Barnsley managed two A String wins in the javelin and discus, producing respective bests of 23.59m and 19.66m. Holly Peck won the A String 1500m in 4m55.91s, and the B String 300m in 46.9s, backing up Lily Heaton’s second in the A String in 46.1s. Morpeth’s other Under 17 Woman performer was Kayleigh Wenn, who finished third in the triple jump (8.55m), and fifth in the long jump (4.06m). There were some very encouraging performances from Morpeth’s band of U 13 Girls. In the 100m A Race Olivia Gent was very close to the winner, when finishing fifth in 14.9s. Erin Buxton finished second in the B race in 15.0s. Olivia only lost out fractionally when finishing third in the A race of the 200m in 30.8s. Freya Caygill finished second in the B race in 31.8s. In the U13 Girls 70m Hurdles Kaitlyn Waddell finished fifth in the A race in 13.7s, and Hannah Lott finished second in the B race in 13.8s. Olivia Gent finished third in the U13 Girls Long Jump A String with a best of 3.73m, and Saveena Mullin finished third in the B String with 3.56m. Kaitlyn Waddell cleared 1.20m to finish third in the high jump.